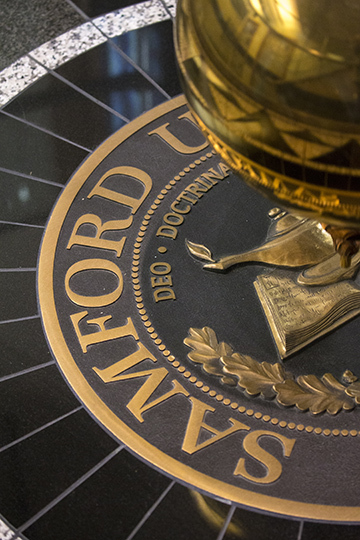 Samford University’s board of trustees executive committee approved new academic programs, new faculty and capital projects during their regular meeting Feb. 9. Trustees approved three new degree programs. The Bachelor of Science in secondary education will allow students to receive a double major in more than one content area. This will give graduates more opportunities in the workplace, according to Samford Provost J. Michael Hardin. The Master of Science in instructional design and technology will prepare graduates with skills and careers in the growing field of instructional design and technology, Hardin said. The Master of Science in health informatics and analytics will enable students to learn multifaceted skills in informatics systems in the health-care industry. Trustees also approved a name change for the Department of Respiratory Therapy to Department of Cardiopulmonary Sciences. The change is to expand the department’s scope, according to Nena F. Sanders, vice provost for the College of Health Sciences. “This will allow us to develop programs beyond respiratory therapy,” Sanders said. Pamela E. Carver, assistant professor of nursing. A Samford alumna, Carver earned her nursing degrees at the University of Alabama at Birmingham (UAB). Shas been program director for Graduate Nursing Education Primary Care Scholars at UAB School of Nursing since 2014. David Cecil, associate professor of social work. He earned his doctorate at the University of Kentucky and currently is associate professor at Asbury College in Kentucky. Crystal Deas, assistant professor of pharmacy. Deas had been clinical pharmacy specialist at the Veterans Administration Medical Center in Tuscaloosa, Alabama, since 2014. She earned her Doctor of Pharmacy degree from Xavier University of Louisiana. Anna-Leigh Stone Hankins, assistant professor of finance. Hankins earned her degrees from the University of Alabama, Tuscaloosa, and currently is assistant professor at Merrimack College, North Andover, Massachusetts. Rebecca Hyde, assistant librarian. Hyde previously was youth services librarian for the Tuscaloosa Public Library. Her library science degree is from the University of Alabama. Moira Jackson, associate professor of anatomy in the School of Health Professions. Jackson earned her doctorate at the University of Aberdeen, Scotland. She currently is chair of the anatomy program at Edward Via College of Osteopathic Medicine in Auburn, Alabama. Patricia Jumbo Lucioni, assistant professor of pharmaceutical, social and administrative sciences. Lucioni earned her doctorate from UAB and her medical degree from Heredia School of Medicine in Lima, Peru. She has been a postdoctoral research scholar at Vanderbilt University since 2012. Elizabeth Ann Sheaffer, associate professor of pharmacy, and associate dean for assessment and accreditation, McWhorter School of Pharmacy. Sheaffer currently is an evaluation expert at Aerotek Inc. She earned her doctorate at George Mason University, Fairfax, Virginia. Trustees also approved the replacement of rigging and staging in Leslie S. Wright Fine Arts Center. The facility is 40 years old, and this project addresses aging equipment, Vice President of Business Affairs Buck Brock said. Total cost of the project will not exceed $675,000.